After Gallipoli, The Australian and New Zealand troops were reinforced and sent to the Western Front. New recruits joined Gallipoli veterans to take over a 16 kilometre section of the line in Northern France. The section stretched from Armentieres village to the Sugarloaf Salient in front of the German-held village of Fromelles. But before taking [the section] over, the men trained passing through gas-filled trenches wearing the cumbersome gasmasks, marching long distances on the cobbled roads and learning to lie down and not panic when faced with the gushing jet of the new German flamethrower. Davidson, L 2010, Zero hour: the Anzacs on the Western Front, The Text Publishing Company, Melbourne, Vic. I was in a silent raid where there were seventeen of us [...] black faces and everything and we got to his line and he had his line with barbed wire, just coils of barbed wire [...] we went over and we got cutting his wire, he was snipping his wire and he put a light on and he turned the machine gun on to us. And [...] seventeen went over and four of us got back. Lockett, J, Transcribed interview on Victorians at War viewed 8 February 2010. The battle of Fromelles, Australia’s first action of World War I, was originally a diversionary attack designed to occupy German troops from another battle. Even though this battle was over, British and Australian generals decided that the objectives at Fromelles were still achievable. The no-man’s-land between the two sides was an expanse of 360 metres and there were doubts about the amount of artillery available for the preliminary assault. On July 19 British artillery began the shelling of the Sugarloaf - named after the cones of sugar that were sold at the time - but were answered by an even greater reply from the German divisions. Three Australian brigades faced the force of the German machine guns. Half the Australian troops reached the German front line and their objective (an abandoned support trench) but the remaining troops could not capture the hill. The Australian forces were now split and a German counter-attack saw them take possession of their old front line. Knyvett, H, Australian War Memorial Website, 'Disaster at Fromelles', viewed 3 February 2010. Although the Anzacs would have more successful engagements in the years to come, and would eventually earn a reputation as shock troops, actions like Fromelles represented the old ways of military thinking: pitting lightly armed men (infantry) against heavily reinforced trenches and the new German heavy machine guns. 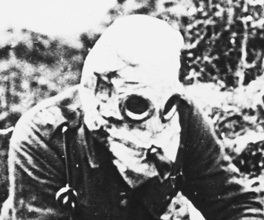 Poison gas, of which there would be 20 different types tested by both sides, was another terrible invention that changed the way armies would fight. Later generals like John Monash would demand that infantry was only used to take ground with the protection of creeping barrages of artillery and tanks that could withstand some of the impact of modern weaponry.